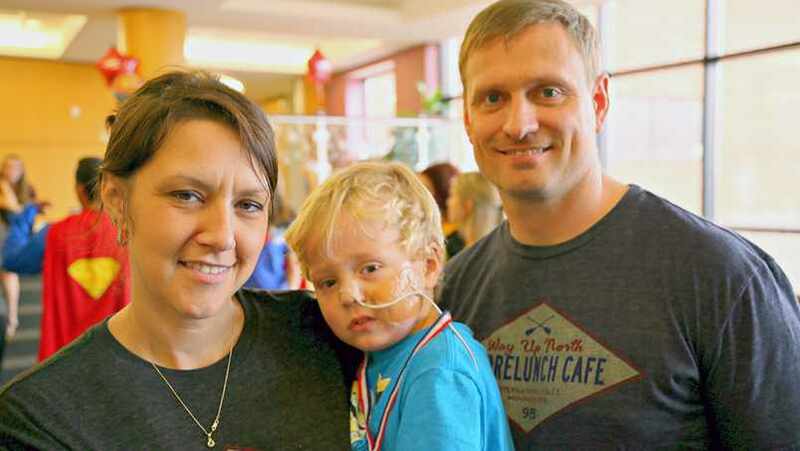 "Noah is our Superhero," Chantill Roberts says as she, her husband, Joe, and son, Noah, enjoyed a recent visit by superhero-costume-wearing window washers at the Mayo Clinic Children's Center in Rochester. Noah, age 3, was enjoying the summer in International Falls, Minnesota, when a chain of events started him on an unexpected adventure. He fell and hit his head while riding his bike. His parents suspected a concussion, but an MRI at a local hospital revealed something even more serious – something they would have not been aware of otherwise. Doctors discovered Noah had a cancerous tumor on his brain stem. And it was growing. The family was referred to Mayo Clinic, and earlier this month, Noah underwent brain surgery. 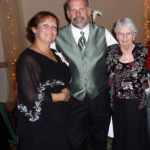 Afterward, the Roberts were told that about 90 to 95 percent of the tumor had been removed. The tumor was in a very sensitive region of the nervous system, and they are in "wait and see" mode right now. Not a place any parent wants to be. Noah's parents say he's not swallowing, and there are concerns about his oxygen levels as he sleeps at night. And they know they will have to remain vigilant, because even though the tumor is stunted for now, it could begin growing again. The next step would likely be chemotherapy. The Roberts remain "very hopeful" that the odds are with them. "We've got a long road ahead," says Joe. "We feel we were blessed that the family was in Minnesota and referred to the Mayo Clinic." A Lieutenant Colonel in the U.S. Army, Joe is stationed in the Washington, D.C., area. But he and Chantill return to International Falls during the peak summer months to run the family-owned Shorelunch Café. "We look forward to it every year. We get to enjoy some 'Minnesota nice,'" says Chantill. This year's seasonal routine was abruptly interrupted by Noah's fall. And they hastily closed the restaurant to focus on his care. Pessimism is not on the menu, however. The Roberts view their son's bike mishap and the tumor discovery as a blessing. "It's lucky for us," says Joe, "because they were able to catch it when they did." And that Minnesota nice also put them in a good spot for Noah's care "They have a world-class facility," Joe says of Mayo Clinic's Children's Center. "We're very happy with the treatment, and we're super pleased with the child services here. They do a great job." 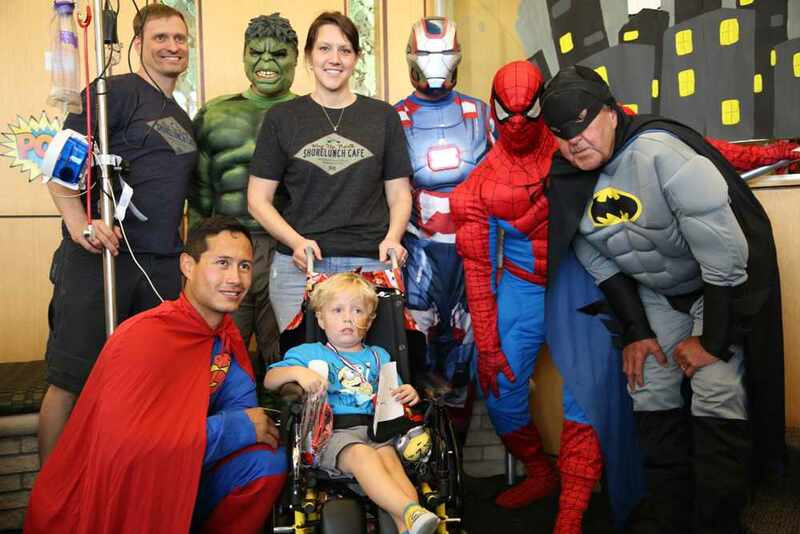 As for Noah, last week he was just happy to take his place alongside the superheroes. After posing for photos with the costumed window washers, Chantill says of Noah, "He loved it and he has been looking forward to their visit for several days." We're looking forward to reading your comments here on the In the Loop blog, plus there are tools above to share this story with others. drop me a short note if you have time and let me know how long you will be there. I currently have Rheumatoid Arthritis- unable to get any medical info regarding flare up that include “bumps to the head” which are sore,causing fatigue, what causes the bumps, is it serious? Any info would be appreciated.